Not sure if this is a bug but can anyone tell me why the bleed area isn't exporting? I'm working in AD 1.7 beta for another project and tested this multiple times in that document and it prints the bleed area fine. But on this document, it's just giving me white around the edge even though a 3mm bleed is specified on each edge. Not sure if this is a bug or me being a doofus and blindly overlooking an obvious option?! I believe this is a bug with the current beta, 1.7.0.4. For some reason, anything drawn on an artboard layer will not display in the bleed area. Perhaps that's by design. I don't know what Affinity are thinking here. Actually, as a follow up to my first reply, I've conducted a simple test of my own. I placed a big red square on an artboard and allowed it to bleed on three sides (left, top, right). On screen, the artwork is clipped to the canvass/artboard. The menu command that controls this is greyed out and not selectable, but in this beta the default choice is fixed: Clip to Canvass is permanently switched on. 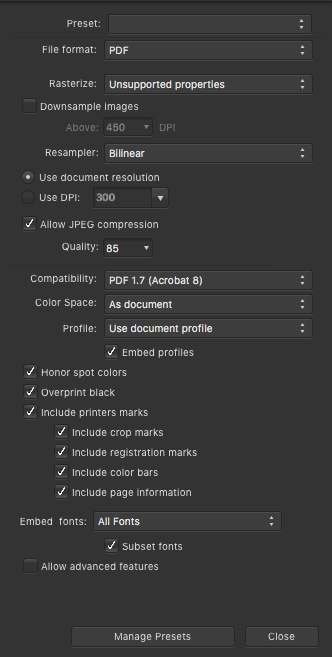 Interestingly, even though the art that extends into the bleed is clipped from view on screen, when I export the document as a PDF with the "Include Printers Marks" options switched on, the exported PDF accurately shows the bleeds along with the printers marks. So, I guess the question now is whether or not Affinity plans to unfreeze the "Clip to Canvass" menu command to enable users to see their bleeding artwork on screen, not just in PDF output. It is a known bug, that bleed is failing to export (and be visible) when used in conjunction with artboards - this is currently with development to be fixed. With regards to 'Clip to Canvas' it is not intended for use with artboards, as objects are always visible when they fully placed outside an artboard. This mode is intended to control that behaviour when not using artboards. 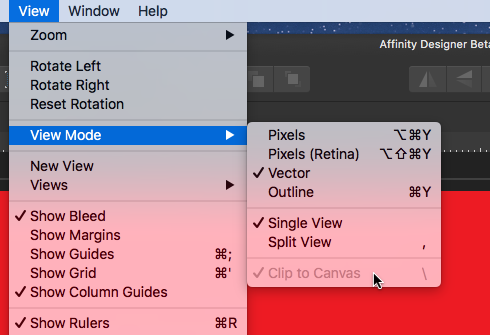 So, Canvass and Artboard are separate concepts in the Affinity app? Seems a bit confusing as the terms are so similar in meaning for me. Is that something that could be cleared up with terms that are conceptually more distinct from one another, or is that pair of closely related terms something that users will need to learn to keep straight? Apart from serving as a kind of layer group, what purpose does the Artboard serve? How is it meaningfully distinguished from the Canvass? Ah, this is good to know. I suppose it is an intermittent thing though as in my other project (using the same beta software) this problem with artboards and bleeds is not an issue. And thanks Mark for your detailed exploration of this issue! Apart from serving as a kind of layer group, what purpose does the Artboard serve? Thanks for the linked discussion. Still questions about the distinctions between Canvass and Artboard remain for me. Why doesn't an Artboard get created automatically upon document creation? Why isn't it just assumed that a designer is going to be creating a composition on an Artboard? Why would you want to compose without a defined Artboard? What special purpose does a "Canvass" have without a defined Artboard? Second, I note that within AF Designer it is possible to group Artboards of various sizes into a multi-panel "canvass" for projects like tri-fold brochures, or book/magazine covers for perfect bound publications, or for dust-jackets for hard bound books. It occurs to me that this capability should be incorporated into AF Publisher to allow for the creation of these same items plus the creation of fold-out pages in magazines and books. @Sean P could you please raise this idea of adapting AF Designer's capability of building multi-panel pages to the problem of creating multi-panel fold-out pages for books in AF Publisher with your colleagues?